Singapore, 4 April 2018 – MVL (pronounced “em-buh l”, Mass Vehicle Ledger) is a Singapore-based blockchain mobility ecosystem company set to revolutionise the way the mobility industry and its related services are connected by allowing for the transparent sharing of a mobility lifetime data. 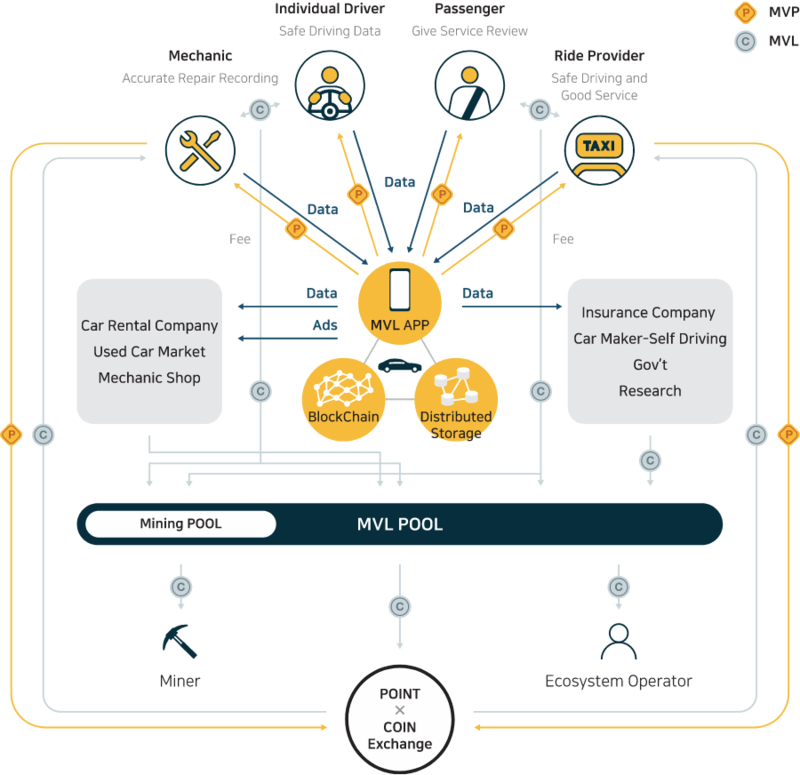 The MVL Ecosystem does this by recording all core data related to driving, accidents, repairs and any other mobility-related transactions on the blockchain. Participants can access this via the MVL mobile application, connecting all businesses, services, and people in the mobility industry. It will also solves the problems faced by consumers in the existing regulation-based mobility ecosystem where information is often fragmented, misleading and worst of all, inaccurate. Regulation based vehicle industry – Leading to a lack of motivation for people to drive well, as the baseline is simply not to get caught. Independent tech-based ride hailing services within the market – This benefits investors, shareholders and founders most, although it is drivers and users who fuel the services’ growth. Disconnectedness of various platforms (e.g. different ride sharing apps globally) – These inconveniences consumers as they are not able to cross platforms and access their data. By applying the blockchain technology which tracks a vehicle’s activity and continuously collect data, MVL addresses these issues through gathering transparent data becomes the foundation which leads to a higher level of trust in the industry. For example, mechanic shops and individual mechanics who provide good service and record repair data accurately will receive incentives. Moreover, professional or regular drivers will be fairly rewarded for driving safely and recording driving data. Subsequently, since customers who want to buy used cars can see its maintenance, repair, and driving data, they will be less concerned about being overcharged as there is clear data on the car’s state. Participants in the ecosystem who provide data will receive MVL Points (MVP), a reward system used to encourage contribution to the ecosystem. The MVL Points collected by these participants can be converted into MVL Coins (the cryptocurrency used in the MVL Ecosystem). Participants can actively trade in this trust-based ecosystem to allow the value of MVL coins to increase accordingly. MVL is under the full ownership of easi6. Over the past five years, easi6 has been providing online & offline connection (O2O) services to travel agencies, car rental companies and taxis in 10 major Asian countries including China, Hong Kong, Taiwan, Korea and Vietnam. Korea’s Minister of Land, Infrastructure and Transport for his contribution to the development of land transportation last December. The MVL pre-ICO will begin on 26 April 2018. MVL (MVL Foundation Pte. Ltd) is a new incentive-based blockchain mobility ecosystem. It records key data such as transactions, movements, accidents, and maintenance of people and vehicles in many fields, connecting them together in a single ecosystem. MVL is a wholly-owned subsidiary of easi6 and is a Singapore private limited company. Over the past four years, MVL has acquired the know-how to provide mobility O2O services to travel agencies, car rental companies, taxis in major Asian countries such as China, Hong Kong, Taiwan, Korea and Vietnam.